We split Bangkok into Zones according to the varying environments, skytrain vs. suburban living, and styles of living, among other things. The main two differences are "city center" versus "suburbs". Zones B, C, and D are the Sukhumvit zones, which consist mainly of apartments and condominiums, though there are many houses here, too. Click on the Sukhumvit link for more details. 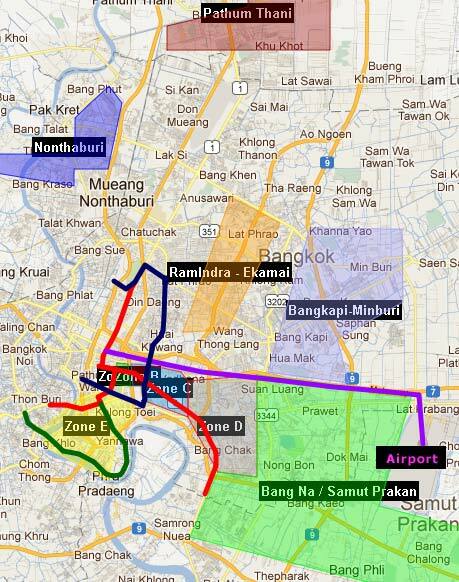 Zone E is the older Silom and Sathorn zones, with a higher ratio of apartments and condominiums vs. houses for rent. Zone A is in between and is a more pristine luxury highrise area.